They can be found splashed across clothing; probing human rubbish in cartoons and poetry; on cups and tea towels, in children’s books and the daily press. Hundreds of ibis-centred objects are for sale online, including gift cards (opens in a new window) and tote bags (opens in a new window). Ibis adorn murals, in Victoria, (opens in a new window) Sydney, (opens in a new window) and Perth (opens in a new window) in Queensland, a baker recently made a cake depicting an ibis eating out of a garbage can commissioned for a 21st birthday. 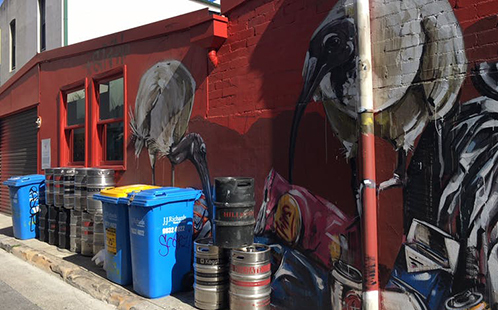 Ibis mural by Scott Marsh in Teggs Lane, Chippendale, Sydney. Courtesy Ilaria Vanni. There is a new vogue for ibis tattoos, especially among schoolies(opens in a new window) in Surfers Paradise and nostalgic Australians. And a prototype for an inflatable ibis (opens in a new window) for swimming pools, created by a local designer and advertised as “an Aussie icon”, was crowd funded in early 2018. Not everyone loves an ibis. Almost 8000 people registered for the International Glare at Ibises Day (opens in a new window) in Sydney on December 21 2016. This event asked people to “gather in your local park and glare and show general distaste towards Ibises”. Ibis now flourish across digital media platforms, where there is a growing list of online pro and anti-ibis films (opens in a new window) and songs. On the other hand, Songtourage’s (opens in a new window) gentle ballad, Song for My Daughter (Who is an Ibis), rejects violent, anti-ibis sentiment. Often dismissed as an introduced vagrant, the Australian White Ibis is one of three ibis species found here (opens in a new window). With that status comes legal protection. Many urban Australians are unhappy to learn about ibis nativity. They want local authorities to remove “immigrant” ibis from their neighbourhoods. A generation ago it was rare to see ibis in Australia’s cities. Now they are thriving on the endless waste our cities provide. Small ibis colonies were established by conservationists in the early 1970s in places like Sydney’s Taronga Zoo and Healesville Sanctuary in Victoria. Ibis also migrated (opens in a new window) from interior wetlands to the coasts of east and southeast Australia and the southwest. That migration was forced by drought and habitat loss, which have caused huge declines (opens in a new window) in inland ibis numbers. Sydney’s ibis population today is estimated at about 10,000 (opens in a new window). Brisbane’s (opens in a new window) population is less stable, hovering around 5,000. More research is needed to know the size and health of other urban populations. Thoth was often depicted with an ibis head. 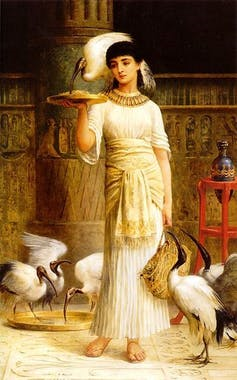 Because of this association, as Georges Cuvier wrote in 1831, Egyptians let ibis “stray unharmed through their cities”. Sacred Ibis were also mummified; there is a stunning example in the Australian Museum (opens in a new window). In our research (opens in a new window), we have been struck by how Australian artists work with the ibis backstory of sacredness, resilience and survival. These artists are commenting on the urban life and times of ibis, and the bird’s new, precarious, celebrity status. Clive, Janice and Derek (opens in a new window) are the stars of the 2018 online TV animated series, Bin Chickens. Targets of human rage against ibis as abject and filthy, the trio struggles to survive in Sydney’s overly cemented Darling Harbour. In vain they also try to recover their lost God-head status. The series, funded by Screen Australia and the ABC, is a sardonic sendup of rampant urban development and its ecological costs. The first episode (opens in a new window) alone has had more than 30,000 viewers. For many artists, ibis-human interactions are emblematic of Australia’s new multi-species urban ecologies. Sue Pedley’s installation “Rolling Musical Screech” (opens in a new window) (2017) featured street signs of birds, and celebrated the sensory contributions ibis make to the contemporary city. 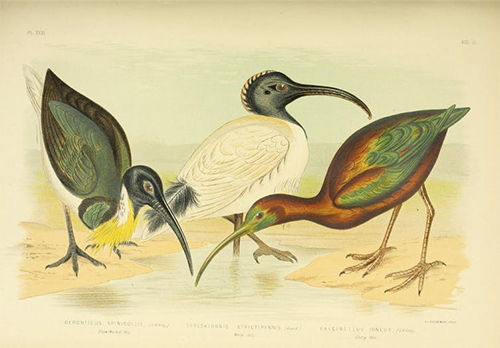 Australian artists also regard ibis as a bellwether species that makes links between habitat loss, climate change and excess human consumption. Sydney-based Linden Braye literally channelled ibis when foraging for waste, and sending up human wastefulness, in her 2016 film, Ibis (opens in a new window). One artistic response to ibis has attracted millions of viewers across social media platforms: the 2017 mockumentary, Planet Earth: Bin Chicken (opens in a new window), directed and produced by David Johns and Matt Eastwood. The film parodies the David Attenborough wildlife documentary, in which animals rarely live alongside humans. This opinion piece co-authored by Dr Andrea Connor and Associate Professor Paul Allatson was first published with full links in The Conversation (opens in a new window).